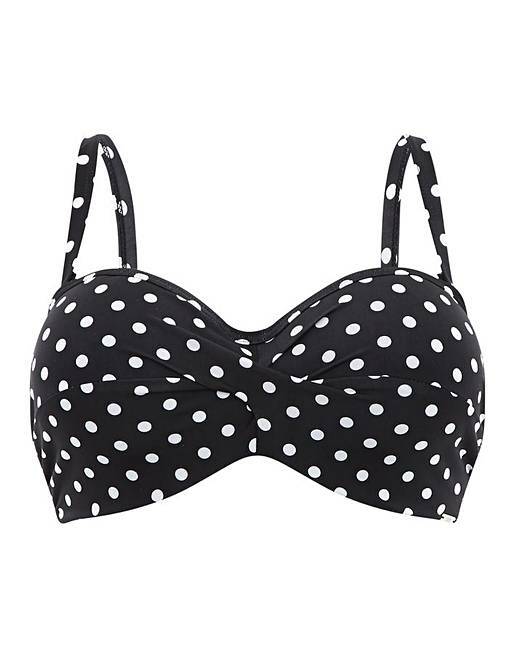 Anya Spot Bandeau Bikini. A classic and stylish range in a Black and White Spot print. The underwired two �piece inner foam cups with a twisted, gathered outer ensure a great supportive shape up to a G cup. Powermesh lined wings with boning in side seams provide firm and comfortable support around the body with extra stability. 30mm clasp provides a comfortable and secure fit across all sizes. 2 x 14mm detachable straps provides additional support and an alternative style if required. Spot prints are always on trend in swimwear. Great mix and match options when paired with other monochrome pieces or more colourful styles.